We're proud that TSO's growing number of locations opens many job opportunities to individuals who would like to become part of our family of eye care professionals. 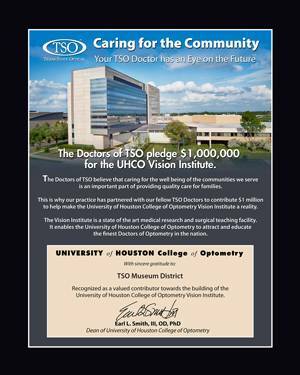 Each TSO office is independently owned and operated by a Doctor of Optometry and while job descriptions, compensation and benefits may vary, you can look forward to opportunity for advancement, a friendly environment and satisfaction in using your skills to take care of our patients. Listed below are the current positions that are available today. The Museum District TSO is looking for a self motivated, eager to learn, candidate to fill a full time Patient Services position. -Providing the upmost customer service skill. -Facing and greeting day to day patients. -Assisting patients with appointment setting and confirmation. -Verifying patient insurance and updating their personal data into our computer system. -Performing a preliminary work up on every patient before doctor’s exam. . Applicants must be 18 years or older, neat in appearance, and able to start immediately. Location: Museum District Texas State Optical. You can submit a resume in plain text here, or attach one in Microsoft Word format. Click in the date field for a pop-up calendar to select your date(s). Leave the "To date" blank if this is your current position.